Broome towermill was built c.1824, close to the Yarmouth Road. The 20 foot diameter, 5 storey, red brick tower was tarred to provide better protection form the elements. The top two storeys were possibly a later addition as the sides were vertical with no batter. The mill had a Norfolk boat shaped cap with 2 pairs of patent sails and a fantail that powered two pairs of French burr stones, one being pair 4' 6" diameter and the other pair 4 feet diameter. To be Sold by Auction. By John Reynolds. At the King's Head Inn, Bungay. On Thursday 29 July instant at 6 o'c. All that newly erected brick built Tower Windmill, with Patent Sails and Winding Tackle complete, driving two pairs of Stones, one pair 4ft. diameter & the other 4ft. 6ins. diameter, with a full sized Flour Mill complete, together with a double cottage & well with good water, a new built bricked stable & cart shed & one acre & 25 perches of Land. The above Pemises are all Freehold & are situate at Broome, Norfolk within one mile of Bungay & adjoin the Turnpike Road to Yarmouth. Immediate Possession may be had. Apply to Mr. Benjamin Goff or Messrs. Kinsbury & Margitson, all of Bungay..
To be Sold by Auction at the King's Head Inn, Bungay, on 29 July. All that newly erected brick built Tower Windmill, with Patent Sails and winding tackle, driving two pairs of stones 4ft. and 4ft. 6ins., with flour mill, together with double cottage and land. The premises are freehold and are situate in Broome, Norfolk, within one mile of Bungay, adjoining the turnpike road to Yarmouth. Apply to Mr. Benjamin Goff. Small Freehold Tower Mill at BROOME near Bungay. A Capital TOWER WINDMILL with patent sails (winds herself) situate at Broome, near Bungay, with tow pairs of stones, flour mill & sack tackling complete, together with a stone built & tiled Dwelling house, stable & cart shed & about an acre of Arable Land attached. Apply to Mr. Calver upon the premises or the Auctioneer, Bungay. To be Sold by Auction at the Queen's Head Inn, Bungay, on 14 October. All that substantial Brick Tower Windmill, with patent sails, two pairs of French stones and flour mill complete, together with a granary and cottasge, situate at Broome by the side of the high road leading from Bungay to Yarmouth, and now in the possession of Mr. George Gosling. Immediate possession may be had. The properety is leasehold at a peppervcorn rent for a term of 1000 years commencing from 26th June 1809. Further particulars from Mr. Everson, Millwright, Bungay. All that substantial BRICK TOWER WINDMILL with Patent Sails, two pairs of French Stones & Flour Mill complete, well situate for wind at any point, has a Stable, Cart Lodge & Granary attached & also a convenient brick & tiled Cottage with about 1a. of Arable & Pasture Land, situate within half a mile of the Navigation & by the side of the high road leading from Bungay to Yarmouth, as now in the occupation of Mr. George Gosling. This Property is Leasehold at a peppercorn rent for a term of 1000 years commencing from 26th June 1809 & is subject to no outgoing. Apply to Mr. Everson, Millwright, Bungay, or the Auctioneer, Bungay. 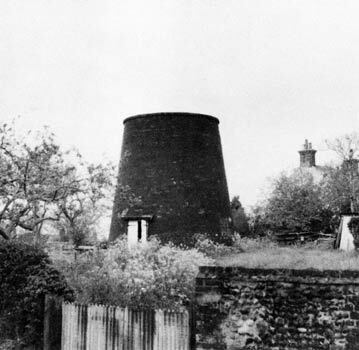 All that substantial Brick TOWER WINDMILL with Patent Sails, two pairs of French Stones, & Flour Mill complete, standing well for the wind at any point, has a brick & tiled Stable, Cart Lodge, Granary & other buildings attached. 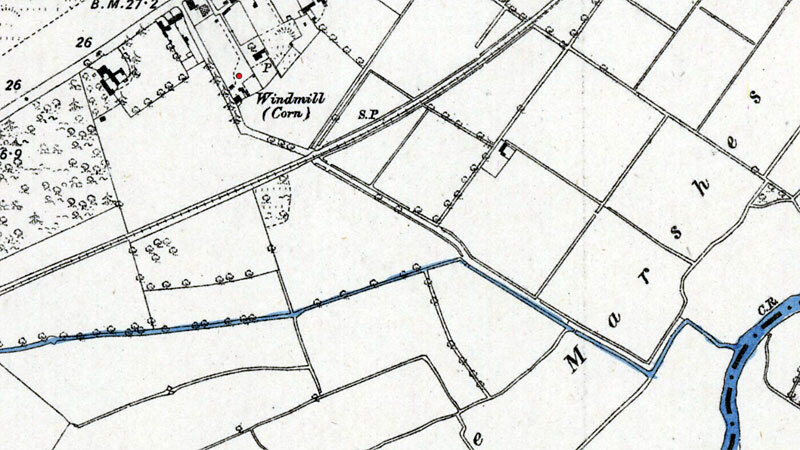 And also a convenient brick & tiled Cottage & about an acre of Arable & Pasture Land including the site of the Mill, situate within half a mile of the navigation & by the side of the high road leading from Bungay to Yarmouth as in the occupation of Mr. Samuel MAYERS. The Property is Leasehold (at a peppercorn rent) for a term of 1000 years & subject to no outgoing. Particulars of Mr. ELSEGOOD, Solr. or the Auctioneer, Bungay. A Substantial brick built TOWER WINDMILL, 2 Stables, Cartlodge & Granary & about 1a.22p. of Garden & Arable Land & Cottage in BROOME the whole in the occupation of Mr. G. G. WARD who is declining the business. The property is held under an unexpired mortgage term of 1000 years commencing 25 June 1809. Premises abut upon the Yarmouth Turnpike & are within a mile of … Bungay. Apply to E.R. PALMER, Solr. or the Auctioneer, Regent Street, Yarmouth. By 1977 the mill had been reduced to just two storeys, 23 feet high with a flat roof.